Give Me Children or I Shall Die (henceforth I Shall Die) is the revised thesis of Laurel W. Koepf-Taylor. In it she seeks to “to contribute yet another perspective to the growing breadth of exegetical voices” through “child-centered interpretation” (12). In doing this Koepf-Taylor seeks to “help scholars avoid projecting anachronistic assumptions onto the ancient texts” (12). Despite this lofty goal, I Shall Die is simple to read given Koepf-Taylor’s lucid writing (even when provocative). I Shall Die accomplishes everything Koepf-Taylor seeks by addressing an “overview of the social history of childhood” (chapter 1) (13), “(in)fertility as a frequent trope throughout the Hebrew Bible” (chapter 2) (43), “evidence [of] a preoccupation with the education/enculturation of children” (chapter 3) (43) and finally a “biblical rhetoric of child death…in the Hebrew Bible differs from the modern moral rhetoric of childhood suffering and protection” (chapter 4) (44). Each chapter builds upon the last providing thorough insights into child-centered texts. In the opening chapter, Koepf-Taylor’s overview starts fiercely when she claims much “classic research…naturalizes Western constructions of childhood, suggesting that its claims are universal” (21). Crucial to this perception is the alteration of how children were viewed after Romanticism (24-33). Mark 10:15 exemplifies how these profoundly different view of children impact how Biblical texts involving children should be read (34). Chapter two applies these insights to the important theme of fertility and infertility. Koepf-Taylor proscribes modern focus on “the parents’ ‘sense of immortality’ rather than their immediate survival” (50) as one of the reasons why this “family subject” (49) is often read with anachronistic assumptions. Instead, tied directly to the infertility themes of the Old Testament is “the economic necessity of childbearing” (54). This has fascinating application to levirate marriage (54-55), the book of Ruth (55-56), the story of Hannah (62-64) and circumcision (69-73). In chapter Three Koepf-Taylor addresses “The Value of Education and Enculturation” (chapter title). Modern education is portrayed as focusing on “succeeding[ing] in future careers” (86) whereas the Hebrew Bible “emphasize[s] the urgency of passing down tradition” (86) often times for “communal rather than individual benefit” (87). This has absorbing conclusions for communities in exile and their cultural survival (91-94). These implications lead into one of the more interesting evaluations of the Biblical texts (Deut 6:7; Exo 12-13; Psa 78) throughout I Shall Die (94-112). Conservative individuals unfamiliar with exilic redaction theories may disagree with Koepf-Taylor’s methods but her conclusions on cross-generational teaching models are thought provoking and insightful. In chapter four, Koepf-Taylor speaks to the rhetoric of child rejection and death found throughout the Scriptures (in particular the prophets). Before focusing on the Biblical texts the modern child rhetoric of child innocence is evaluated (116-122). It is here that some of the most provocative and poignant portions of I Shall Die rise to the surface. Withholding no critical evaluation, Koepf-Taylor notes that “child protection is a fantasy of adult and parental omnipotence” that is the derivative of “irrational belief” (120). This modern paradigm makes it hard to understand the Hebrew Bible as “purposefully threatening” to children as a threat to “cultural and communal survival” (120). This concept is then poured into enthralling investigation of the familial-spousal language of Lamentations (126-130), Jeremiah 3 (132-139), Hosea (139-143) as well as the general themes of Jeremiah, Isaiah and Ezekiel (143-147). Along with the introduction, this discussion completely justifies the cost of I Shall Die (which as a thesis is admittedly high). 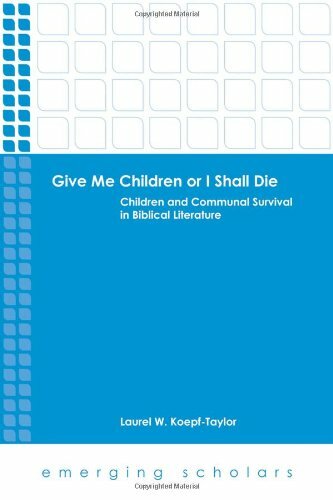 In conclusion, Give Me Children or I Shall Die is a captivating introduction to child studies and their application to the Scriptures. More theological conclusions would have been beneficial while evaluating the Old Testament prophets but also would have largely expanded the focus of the thesis. The insights of a child-oriented account of the ancient world upon the Biblical texts are weighty and hermeneutically challenging. Valuable to scholars, pastors and those generally interested, Give Me Children or I Shall Die is fantastic.